Angra's vocalist Edu Falaschi has recorded his first solo album. The project is called Almah and it relies not only on Falaschi's talents as a singer, songwriter, arranger and producer but also on the likes of drummer Casey Grillo (Kamelot), guitarist Emppu Vuorinen (Nightwish) and bassist Lauri Porra (Stratovarius). 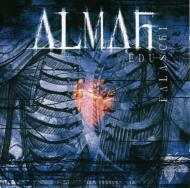 Almah has participations of several guest musicians, such as Mike Stone (Queensrche's guitar player) and Edu Ardanuy (Dr. Sin's guitar player), among many others, and was mixed in Brazil by producer Adriano Daga. Daga has worked with many artists during his winning career, including Lenny Kravitz and Silverchair. He was even awarded a Grammy in 2005.